The picture editor shows the pic itself in the main window, and the picture command list on the right. SCI pics consist of a series of vector drawing commands, and the editor reflects that "limitation". Bitmaps can be converted into vector drawings, but the process is inefficient, so you need to get used to thinking like the editor. Pics consist of three "screens". The visual screen, which is what you see in the game, the priority screen, which controls which parts of the picture appear in front or behind the ego, and the control screen, which controls events that happen to characters in the game. You can view each of these screens by clicking on the appropriate button. Since the picture resource consists of a series of commands instead of a bitmap, you need a way to move around to different points. Any drawing commands you do are added to that particular spot in the picture. The quickest and most obvious way is to use the slider bar at the bottom of the screen. It shows the current position, and lets you instantly move to another position. On the right hand side of the picture editor is the command list. It shows the commands around the current position in the editor. It can be used to move to another position by clicking on a command. A thin green line reminds you exactly where you are positioned. Here you can select multiple commands and delete them, or crop all commands after a particular point. More interestingly, you can also copy commands from here, and paste them into other pics - even in other running instances of SCI Companion - so you can copy and paste commands from one game into another. It takes some practise to select the correct set of commands to copy. Generally it is best to click on the command you want to start with, and then progressively scroll down the list and use the SHIFT-click to find the end command. Then click Copy at the top of the command list. When you paste a series of commands, they will be added to the pic in a special mode that allows you to reposition them. You may see strange behaviour as you move the drawing commands around the screen, but that is due to the vector nature of the commands. When your picture gets big and complex, it can often be difficult to quickly narrow in to a particular position. If you need to go to the spot where a pixel last changed its colour, the history tool will do that. Left-clicking on a part of the pic will bring you to the point just before that pixel changed colour. Right-clicking will bring you just after. Use the zoom tool to zoom in (left-click) or zoom out (right-click) on the pic. You can also use SHIFT-mouse wheel, or CTRL-minus and CTRL-plus. There are three main drawing tools: pen, fill and line. Unlike SCI Studio, SCI Companion doesn't make you choose between "short" and "long" versions of them. The editor will automatically use the most space-efficient commands when saving the pic to the game file. SCI Companion currently supports one level of undo in the pic editor. The pen tool requires a bit more explanation, and offers more functionality than in SCI Studio. The 32 options of pen shape, size, and pattern are chosen from the Pen Style button on the toolbar. A preview of the pen (e.g. 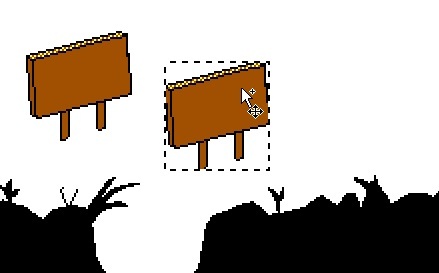 what will happen when you click) is shown as you move the mouse cursor over the image. If you are using a "pattern", the pattern will change randomly with each click (SCI Studio does not expose this functionality of pic resources). This should let you get more natural looking transitions between areas of different colours. You can disable random patterns in the Pen Style dialog. In either case, right clicking will cycle through the next pattern (128 different patterns for each size and shape). The fill tool is one of the biggest sources of frustration with people drawing their own pics, because it only allows you to fill "blank" (previously unfilled) areas. 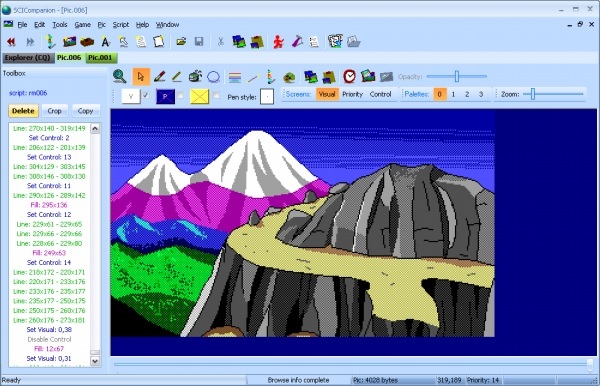 I suppose Sierra did this so the artists would be forced to be space efficient. At any rate, it is an annoying but unavoidable feature. Design your pic with this in mind. Another important thing to mention about the fill tool concerns dithered colours where one of the colours is white. If you have, say palette 1 where color 5 is composed of yellow and black; and palette 2 where color 5 is composed of yellow and white; then you might have a problem. Fills will look different because often dithered colours that include white will let a fill leak through a spot where it would not if it didn't include white. If your picture looks really messed up when viewing with a different palette, it may be due to this. This tool is pretty straightforward. At any one point, the drawing takes place on any of the three screens. The colour used on each screen, if any, is controlled by the "V", "P" and "C" buttons on the toolbar. If nothing appears when you draw, it is because you are drawing on the screen at which you are currently looking. You draw on the visual screen with one of 40 "colours", each one of which is composed of two of the 16 EGA colours. There are 4 palettes of 40 colours. A pic may be drawn by the game in any palette you choose. The palettes are chosen using the palette button in the pic editor. 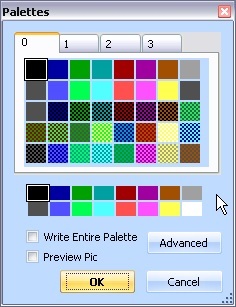 This brings up a dialog where you can assign colours to each of the 40 positions of each palette by right and left clicking on the source colours at the bottom. When you close the dialog, the palette is set in the command stream, at the particular spot in the pic. So you can change the palette many times through the sequence of commands that makes up the pic. If you check this box, then the entire 40 colours are written into the pic's command stream. This may seem inefficient, but it is may be the right thing to do, as the alternative has some often undesirable effects. If you only write the colours you changed to the command stream, then these colours become "locked". That is, no matter which palette the game uses to draw the pic, that colour index will always be drawn with palette 0's colour. Generally, you insert palette commands at a particular spot in the pic (e.g. near the beginning). If you want to see what the final result looks like as you try out different colours, you can check the preview palette box. It will temporarily move the position of the pic to the end, while you manipulate the colours. This feature lets you superimpose an image of the ego (or any view resource in the game) onto the pic, and drag it around. It interacts with the priority screens, and can help you size elements of the picture correctly. The view resource used for the "ego" is the one that is currently selected in the resource explorer. In the preferences dialog, you can also specify that a simple box should be used instead. If nothing shows up when you turn on the fake ego, it may just be hidden behind a higher priority object in the picture. In that case, right clicking on the picture will center the ego under your mouse cursor. The coordinates of the ego are shown as an aid for setting them in script. In fact, if you use the wizards in the script editor to create a View, Prop or Act object, the x and y properties will be set by default to the currently location of the fake ego. By clicking on the Priority lines button, the pic's priority lines will be overlaid on the image. You can paste a bitmap into the pic editor, and it will be used as a tracing image. You can also open an image from a file . The tracing image can be turned on or off , and its opacity can be set. 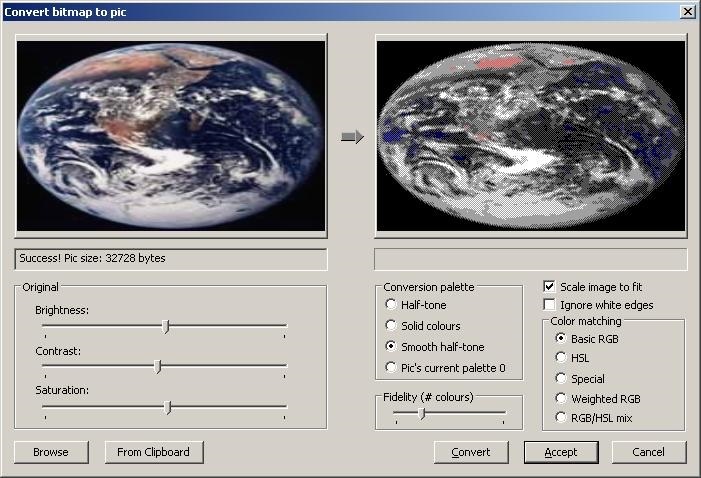 The convert bitmap to pic dialog will allow you to take a bitmap (or jpg, etc...) from a file or the clipboard, and convert into vector commands to be added to your pic resource. Choose Import bitmap to pic from the Pic menu. This will open a dialog. If an image is on the clipboard, it will appear on the left. Otherwise, open an image using the Browse button. Adjust the picture using the Brightness, Contrast and Saturation controls. Click the Convert button. 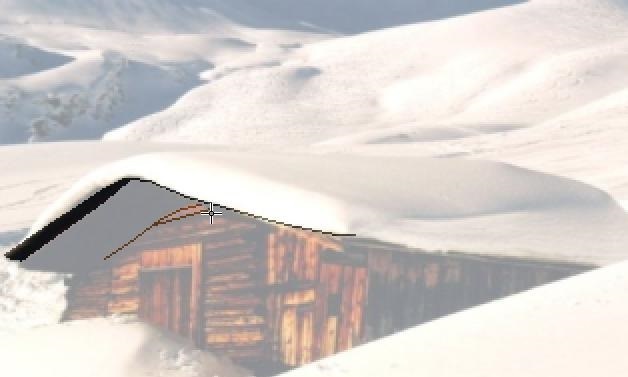 A progress bar will animate as the conversion takes place, and the resulting image will appear on the right. Check the image size - is it small enough to be a SCI0 pic resource? The options on the right control the conversion process - which colours are allowed, and how many to use. Selecting different options can have a big effect on picture size. Drawing in a vector format takes some getting used to. Don't draw over it. Your life will be easier if you move back to that point and fix it.